* First make a summery notes on every unit in every subject. * go through the previous question papers and see , how the questioning is . 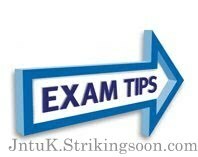 * if you want to write any question first think of it once and write the answer providing side and main headings. * try to draw the appropriate diagrams for the selected question. * it is better to choose the questions, which are having waveforms , figures and block diagrams etc., which gives the perfect info about the matter what you wrote in the answer, then it is simple for the examiner to correct your paper. * don't give improper and not related answers. * Follow the standard books . * don't hesitate or don't feel tense while entering the exam hall. * before writing the answers once go through your question paper and select the questions, for which you can write the appropriate answer. * don't fear to express in the answer sheet. All The best to all TeChNoCrafts of the society.